Coronary heart disease is one of the most prevalent causes of death among men and women. Silent coronary heart disease is difficult to diagnose because it doesn’t have prominent symptoms like heart attack or heart failure. One of the most common coronary heart diseases is Angina Pectoris. In case of Angina, a dull and heavy chest pain or discomfort is experienced along with pain in neck, throat and upper abdomen or back. Heart attack symptoms range from chest pain, heartburn, neck pain, nausea and vomiting to shortness of breath, palpitations and upper body discomfort. Chronic disease such as diabetes, hypertension, kidney problems and atherosclerosis also puts strain and pressure on the heart. Therefore, it is necessary to maintain a healthy heart by making healthy choices and lifestyle changes and support the healthy working of the heart with the help of acupressure therapy. Acupressure helps to improve cardiovascular health by lowering blood pressure, supporting organ function, improving circulating and decreasing inflammation. Caution: Acupressure should not be used as a treatment for heart attack. If you suspect a heart attack, seek emergency medical treatment immediately. There are a number of health conditions and factors and increases the risk of heart diseases. You can stimulate a few points from this list of potent acupressure points for the heart in order to relieve angina, chest pain, tightness, fast beating of the heart and palpitations and maintain overall heart health. 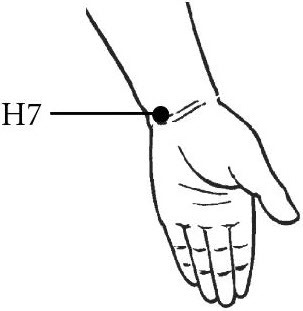 Acupressure point H 7 or Heart 7 is the ultimate pressure point which addresses all the symptoms of heart disease. This point is called the Spirit Gate, and it is situated on the palm side of the wrist, in the wrist crease, directly under the little finger. This point can be activated in both hands by applying gentle but firm pressure on the points using the thumbs for 1 minute while breathing in a relaxed way. It aids to nourish all aspects of the heart and is beneficial for treating all heart diseases and syndromes, heart palpitations, angina pectoris, irregular heartbeat, pounding heart, hypertension, and arrhythmias. It also helps to treat problems of insomnia, muddled thinking, anxiety, nausea and emotional and psychological issues. Acupressure point P4 or Pericardium 4 is another effective pressure point that is used to treat all types of heart problem symptoms. 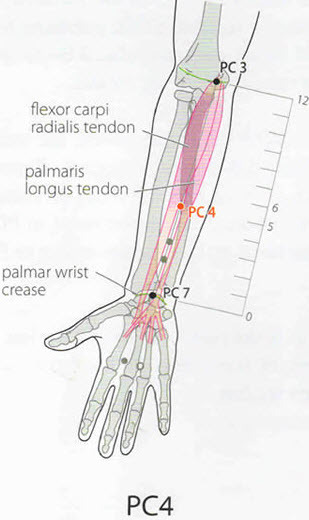 This point is termed the Crevice Gate, and it is located on the palm side of the arm, halfway between the wrist and the elbow, one chon towards the wrist. This point is in line with the middle finger. This point can be stimulated on both arms by firmly pressing the points using the thumbs for 1 minute while breathing deeply. It is sued for curing rheumatic heart disease, angina pectoris, chest and heart pain, fast heartbeat and palpitations. It also aids to relieve epilepsy, depression, fear and anxiety. Acupressure point P6 or Pericardium 6 is a vital point of acupressure therapy that is widely used for chest pain treatment. This point is called the Inner Gate, and it is found on the palm side of the hand, right in the middle of the arm, three finger widths above the wrist crease. This point can be activated in both hands by applying steady pressure using the thumbs for 1 minute. It helps to regulate, strengthen and protect the heart. It is useful for relieving cardiac and chest pain, chest tightness, angina, rheumatic heart disease, palpitations, and anxiety. It is an important point for relieving stress, mania, motion sickness, vomiting and carpal tunnel syndrome. Point P7 or Pericardium 7 is an important point of acupressure for heart that is extremely useful for angina pectoris treatment. This point is known as the Great Mound can be located if you look at the palm side of the wrist crease and locate the point halfway between the inside and outside of the wrist. This point can be stimulated in both arms by applying light but firm pressure using the fingertips for 1 minute. It helps to regulate and clear the fire in the heart, relieve palpitations, angina, chest pain, and anxiety. In addition, it is also beneficial for treatment of maniac psychosis, vomiting, and gastric pain. Acupressure point LI 11 or Large Intestine 11 is specially intended for cardiovascular disorders that spring from high blood pressure or hypertension. 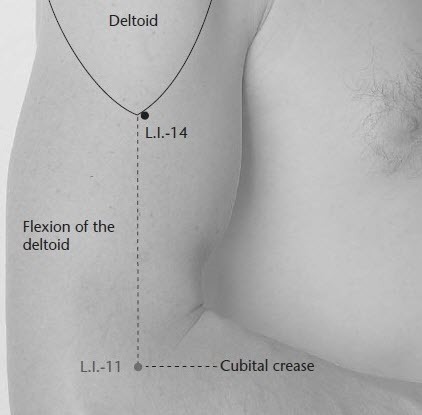 This point is situated at the top of the elbow crease, on the edge of the joint and it can be activated in both elbows by applying pressure on the points using the thumbs for 1 minute. It facilitates Qi and blood flow through the veins and arteries and control hypertension. It also reduces high fever, cures skin diseases, digestive problems, menstrual issues and menopausal symptoms, heat stroke, and blood circulation issues. It is also a local point for tennis elbow treatment. 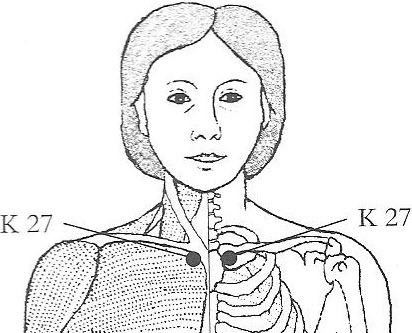 Acupressure point K27 or Kidney 27 is a potent pressure point for addressing cardiac problems. This point is called the Shu Mansion, and it is situated under the collar bone, in the hollow at the side of the breastbone. This pair of points can be activated on both sides of the breastbone by applying firm pressure to the points using the fingertips for 1 minute. It tonifies the kidneys, maintains fluid balance in the body, opens the chest, and relieves chest pain, chest tightness, palpitations, and anxiety. It helps to promote the immune system functions and enhances natural energies in the body, improves overall health and reduces general weakness. Acupressure point CV 14 or Conception Vessel 14 is another powerful pressure point for treatment of angina pectoris and other heart problems. 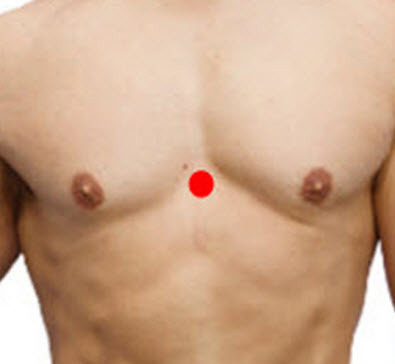 This point can be found two chon below the bottom of the breastbone, in the middle of the body. This point can be activated by holding it gently with the fingertips for 1 minute. It helps to relieve chest pain, Chest tightness, angina, palpitations, and anxiety. In addition, it is also helpful for addressing the problems of maniac depression, muddled thinking, anger outbursts, panic attacks, epilepsy, breathing problems and asthma, cough, nausea, vomiting, abdominal pain and acid reflux. 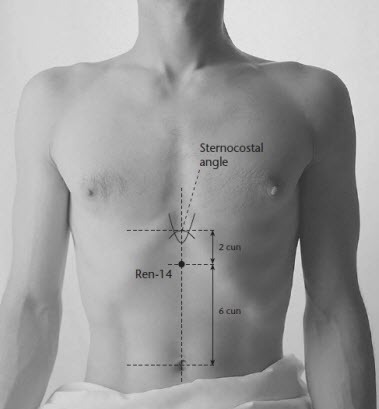 Acupressure point CV 17 or Conception Vessel 17 is a potent pressure point for treating angina pectoris symptoms. This point is termed the Upper Sea Qi and it is located in the center of the breastbone, midway between the top and bottom, and then down one chon. This point can be stimulated by applying light pressure to the point using the fingertips for 1 minute. It is used to reduce palpitations and cardiac pain. It is a useful point for asthma, cough, and diaphragmatic pain, postnatal issues like insufficient lactation and mastitis and sore throat. This point facilitates overall Qi flow throughout the body. Acupressure point LV 3 or Liver 3 is yet another beneficial pressure point for addressing all types of heart problem symptoms. This point is called the Bigger Rushing, and it is situated on the top of the foot, between the joining of the big toe and the second toe. This point can be stimulated by applying strong pressure on the point using the fingertips of the index finger and middle finger. It stimulates the liver energy and promotes the smooth flow of the Chi. It helps to calm anxiety, irritability, anger and soothe palpitations and fast heartbeat. In addition, this point is also used to treat male impotence, digestive issues, menstrual issues, eye problems, headaches, and dizziness. LI 4 or Large Intestine 4 is perhaps the most famous pressure point on the acupressure points chart that is widely used to treat chronic pain and various types of diseases. This point is called the union valley and is found on the fleshy joining between the thumb and index finger. This point can be activated in both hands by applying strong pressure on the point using the thumb and fingers for 1 minute. This point helps to move the Qi and blood in the body and clears stagnation, which in turn relieves chest tightness, chest pain, heaviness, and palpitations. It also helps to boost immunity, treat TMJ problems, headache, fever, eye problems and skin diseases. Pregnant women should not stimulate this point because it can promote labor. Keep your heart healthy and beating strong and cure the problems of chest pain, angina pectoris, palpitations and anxiety with the healing touch of acupressure therapy, which has absolutely zero side-effects. We hope it benefits you. Very useful website and explanation is very lucid. Kindly enable a search option for looking treatment for specific health problems. Very nice article. Just one correction, for LI 4 the illustrated picture shows Li14. Thank you, will look into it and correct it accordingly. I relieve heart pain by pressing on a point halfway between my solar plexus and my belly button. You’ve still got the photo of LI 14 accompanying the text referring to LI 4. I just left a question above not knowing that i could leave a reply. Excellent.Will repeated treatments possibly eliminate angina and high blood pressure? it’s manic depression, not maniac depression. term maniac was used instead of manic earlier in the article, too. it’s 3/20/17 and LI4 still has Li11 picture.